Murray Newlands is an internet marketing veteran, a "green affiliate", he runs his own affiliate network... and he is also known for conducting some of the best interviews on the net at his (new'ish) blog. He recently published an interview with me, and I took the opportunity to ask him a few questions as well. Reading your bio, I saw that you were a lawyer up until the late 90's when you transitioned into a full-time internet marketer. Can you tell us what precipitated that transition, and why you chose such a dramatic career shift? Well when you are 17 you choose what you are going to study at university in the UK you really do not know much about the other end. I qualified as a lawyer and I was on the National Committee for your solicitors and doing well but I did not like it. I knew I wanted a change. My girlfriend at the time was a designer with a full time job and doing some freelance work. I took some time off work sold some design work and before you know it we had an agency. Well it has been quite a ride but a few years ago now I was lucky enough to work for the UK office of a US company and they kept bringing me to the US so that when I move on I kept my business contacts and things have developed from there. You have a wide range of online business experience, and currently run your own affiliate network. Give us an inside look at what you do online, and what you offer. For me online marketing is all about the people. From people flow great advertsing offers and great relationships with affiliates. Good advertisers and affiliates have a choose as to who they work with and they only work with people they want to. Most of what I do is finding out how to help people and then doing it. Who wants what leads or sale and who has traffic and needs offers. I noticed that you just started blogging this year. In another interview you mentioned that you wish you had started blogging earlier. Given this is your first year as a "blogger", what would you advise others who are just now setting up their first blog? Yup I started my Marketing Blog this year. Finding some good bloggers to give you advice and learn from them about how to succeed. The things I have learned the hard way that could have got my blog going so much faster but you live and learn. Do learn about SEO and do get some blogging buddies. Your blog content is great, by the way! Has blogging become a big part of your online marketing & exposure strategy? My blog has become a big part of my online and offline exposure. I interview people on my blog and it has been a great way for me to reach out and connect with people who I would otherwise have never meat, both online and offline. I am running my first offline Blogging event in New York next week and I am very excited about that. Prior to starting your blog, how did you market yourself online? What were/are your favorite marketing strategies? Prior to blogging I used more forums and facebook a bit but looking back I did not really get online marketing in the same way. The thing I love about having my own blog is that I can make it what I want. Social Media has brought consumers a voice which they did not have in the same way before and they have learned to use it to vocalize and mobilize discontent as well as delight. Social Media has in Obama’s case changed governments. If it can do that what can it do for your sales? Marketers have learned that there are social media influencers many of whom are bloggers that can lead this conversation and blogger outreach programs are increasingly popular. In a recent presentation at Izeafest, you shared a message on the current landscape titled "Content is Dead, Conversation is King". What top 3 ways would you recommend that people engage with their target market, or get involved in the conversations in their niche? -SEO is still a great way to engage people in your niche, by writing about topics your audience are searching for and having your good content found you can engage. -Going to events and meeting people face to face and ask them about your niche and get their opinions, people like to be in a conversation where they talk. -I have to say the T word Twitter, search for conversations on your chosen topics and engage in those conversations. -I would also have to add blogging outreach. Find blogs in your niche and make constructive comments. Networking seems to be key for you. I like how you seek out relationships, and look for opportunities to get fully engaged. For those that cannot travel, what would you recommend as the best ways to meet and network online with others in their industry? Simple. Find the people who do travel connect, and influence others and connect with them. Find their blogs and comment, friend them on facebook and comment on their status and twitter with them, converse online. It does take longer but I have many friends I converse with online. If you know people who do travel to events and connect online ask for introductions. If you were consulting with an aspiring affiliate marketer, what advice would you give them for the start-up phase? People thing then they are starting a business they will make money from the start, if often takes money and time to get going. Think about all those things you are good at and how much you have learned to get you there. Find someone good to teach you and listen to them. It takes time and hard work, keep going. At the same time you have to bring your own thing to it to make it unique special different and successful. Thanks, Murray - it was a pleasure getting to know you! 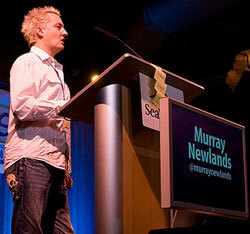 Likewise Murray - I am following your blog and twitter stream now, and look forward to hearing more from you! Hey Lynn, how are you? Did you get my questions? I hope you like them! Have a great weekend! Happy to connect two people that inspire me very much. Reading the interviews is like seeing two great minds at work. Looking forward to seeing what is in store with the two of you! I'd love to do a quick Q&A with you on attending industry events. Would you be interested? I am looking for Internet Marketing, Direct Sales and MLM's that are interested in listing their information in my upcoming ebook. I would love to have some of you listed. Please contact me for more info..
Hi Lisa Marie. What is your book about, and what type of inclusion are you looking for, specifically? I definitely need to follow his last recommendation; gotta find that person. It helps. I credit Rosalind Gardner for my affiliate success as I purchased her Super Affiliate Handbook almost 6 years ago and have studied her work ever since. It's good to find someone doing what you'd like to be doing, and follow their model. A really interesting interview, some great tidbits of info here, plenty for me to work on. Going out and actually meeting people, it's great to be reminded of the importance face to face communication.